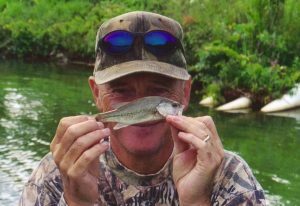 Now, I like my standard format for my fishing report postings as I feel that they tell the tale just fine with an intro, a batch of stats, a handful of notes on the highlights, lowlights, observances, random happenstance and, of course, pics. But several times in the pre-blog days I wandered off that path in borrowing a page from Bassmaster magazine’s “Day on the Lake” feature. For those not familiar with the magazine’s monthly series, the concept is to put an angler on an unfamiliar body of water and then provide a chronological account of the decisions, results and conversation during a seven hour day. The articles finish with the angler’s assessment of the day, what approach they would take were they to return “tomorrow” and yep, a Top 5 weight. It has been my favorite feature in the magazine since its inception many years ago and is always my first read when the latest issue arrives. 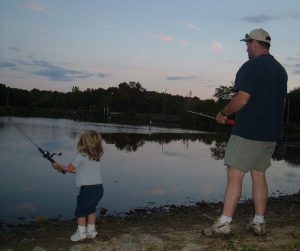 My kickoff date for my new website venture to start this month marked fifteen years of writing which all began with occasional fishing, trapping and general outdoor reports to family and friends prior to becoming a blogger back in April 2010. 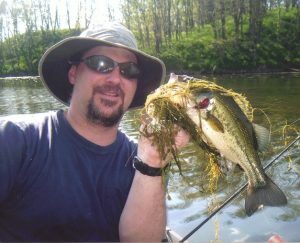 Among those pre-blog postings were seven of the “Day on the Lake” type postings of my design, borrowing some of the concepts from Bassmaster along with inventing some of my own, including taking a photo of every fish we caught no matter the size. My archives indicate that I kicked off this idea in 2002, posted a pair of these reports in 2003 and then made it an annual project with one a year through 2009 (skipped 2006 for some reason, probably had another kid or something). 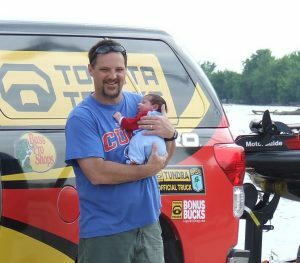 Each of the outings were trips with a partner, either Dad or my brother, Brent, but unlike the Bassmaster version all but one were trips to familiar waters. I just finished re-reading each of the old reports and while some are a bit lengthy, I still found them quite entertaining. Of course, I had a front row seat and certainly possess a bit of bias as the author. Still, it is fun to look back and reminisce over days spent on the water with your best fishing partners. Some “Days on the Lake” were more successful than others in terms of fish but as I continue to put a few more years and fishing trips behind me I’ve come to realize that fishing is about a whole lot more than catching. Yet again, a ringing endorsement for keeping a log/journal or in some way recording your day on the water. For within those postings and log entries there are countless details that still bring a smile or a shake of the head, details that would have long been forgotten had they not been documented. Good stuff then, good stuff now and good stuff for the future. So, this resolution is to take another swing at this approach at least once this year after being put on the shelf since 2009. More details to come and perhaps a revisit of the past postings prior to kicking off the 2017 version. After all, who doesn’t like a fishing report, even if it’s nearly 10 years old? Okay, so I know that the collection of baits in the photos below do indeed catch some bass and some really good ones at that. 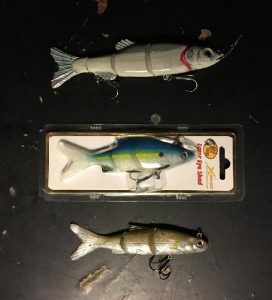 However, I just can’t seem to put down my confidence baits in favor of any of these varied lures that are generally categorized with “Swim” as part of their names. 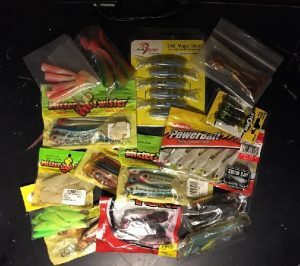 Got a pile of these baits from a couple different manufacturers including some designed by “Stream Stalker” Jonn Graham that I picked up several years ago at the Elmwood Outdoors Show. 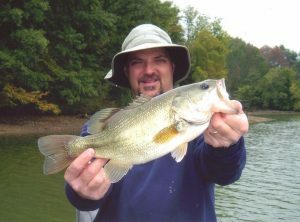 My logs indicate seven bass in 2013 and two in 2014 in limited use as I’ve never really given them a fair shot despite their successful track record in Jonn’s blogs and personal correspondence with an angler in our Top 5 project. 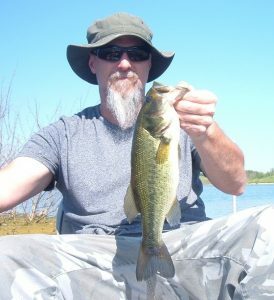 During the four year run of the Top 5 I have received more than a few pics of some monster fish caught on some monster swimbaits but I have yet to take the plunge. Very tempting but haven’t been able to convince myself to trade quantity for the quality bite. So the goal is to catch some fish on each of these two bait categories from something pictured in the collections above as I’ve got plenty to choose from and the price tag on some new swimbaits in particular scare me half to death. Definitely double digits on most of the hard bait type swimbaits which are pretty much out of my price range these days so I’ll stick with the low budget models I’ve got. However, one did catch my eye on a major online tackle retailer that sells for $439.99. The order page actually has a blank for quantity too, like I would buy more than one. Dang, I think I’d be better off mounting that thing on the wall than the trophy it might catch as I would definitely not throw something in the water that carried such a price tag. Can you imagine snagging that thing in a submerged tree or having a fish break you off? While the 2017 version of the Top 5 has ventured into a trial run of species beyond the standard bass offerings of the first three years, submissions have been kind of lean. Four northern pike represented the other species until the fish below came calling this weekend for one eager young angler. So eager, in fact, that he is back at it again this morning with one of his sisters in tow. Angler Comments: It got on my line, I started reeling and I was struggling though. It got stuck in the kinda weedy part and then got out of there and I just caught it. Our oldest boy, Jayce, turns 8 today so Happy Birthday wishes to an entertaining and thoughtful outdoor buddy. 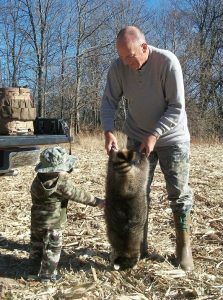 To celebrate the day in an outdoor way, here’s a collection of images and a favorite story about one of my main men. Some great pics, great memories and looking forward to more. However, gonna be tough to top the following fish story that we shared last spring. But that certainly doesn’t mean we’ll stop trying. 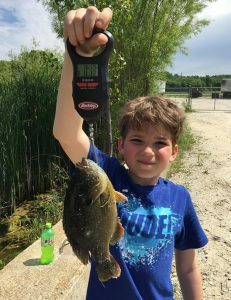 Last June during a family camping trip Jayce and I were chasing panfish on a Little John Conservation Club lake with decent success by casting to the boils of a bluegill school we periodically observed rippling the surface. I’d row over within casting distance and “Bang!” we were reeling ‘em in until the school dipped below the surface only to reappear elsewhere on the lake and the chase was on to row over and repeat the process. We were having a ball as Jayce was plucking them from “the herd” as he described it when surprisingly a fish of a different color went airborne shortly after the bobber went under and another catch, this time a bass, had pretty much hooked itself. Now all fish are cool when you fool ‘em and I try to heap on the praise with each one the kids reel in to congratulate them on a job well done and to help feed the sense of accomplishment. 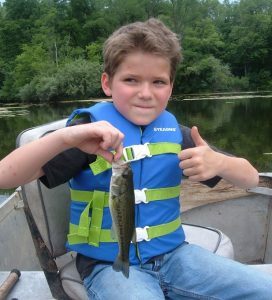 But when it’s your boy’s first bass, well that’s cause for a little extra celebration in my book, especially for a sensitive young fellow who needs a bit more of a confidence boost than his siblings. We had a time and, of course, took a couple pics to show Mama upon our return and eventually Papa the next time we saw him. Me too as I type up this post nearly a year later. In 2016 I landed bass in 22 different lakes as I manage to get around a bit without actually having to wander too far from home. All of my bass were caught within roughly an hour of my driveway and most of my primarily public stomping grounds allow me to hit several bodies of water within the same trip. Even so, there were just as many potential fishing holes on my list that did not get a visit in 2016. Not surprisingly, when contemplating most of my trips I wind up having a little trouble devising a game plan when faced with so many choices; a nice problem to have. 2016 also saw the addition of two new bodies of water to the list, Boss Lake at Mautino SFWA in Henry County, IL and Lost Grove Lake in Scott County, Iowa (as noted in yesterday’s post). And I’m looking to make it even more complicated by exploring some more new water in 2017. Browsing the internet, I’ve got my eye on a few spots already. The criteria I was looking at was to find new water located within about a 70 minute drive of home. Initial research shows several possibilities on the other side of the river. Sounds like a good way to get more out of my non-resident Iowa fishing license, the first of which I purchased last year prior to my two Lost Grove Lake visits. As far as the Illinois side, I’ve got a couple walk-in lakes as possibilities at some sites that I already visit. 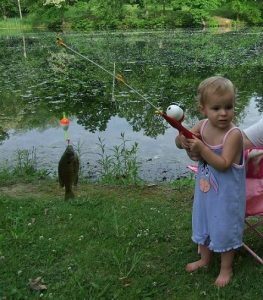 In addition, there are several lakes that I fished quite a few years ago that may get some consideration in Henry County’s Johnson-Sauk Trail, Rock Island County’s Lake George and Whiteside County’s Lake Carlton. The Hennepin Canal also provides numerous access points within reasonable distance but not sold on the bass potential without some more research. Sometimes it’s tough to wander away from some of my productive regular haunts but sure is fun to get a look at some new water. Time will tell which new water(s) that will be as I often don’t make up my mind until I’m loading my gear. 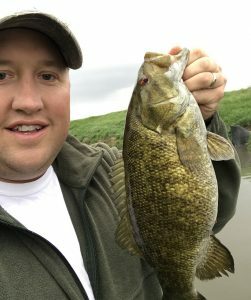 Prior to last year I had never caught a bass from Iowa, never really had to with plenty of Illinois water to choose from. Closest I’d ever been I suppose were a few on the Illinois side of the Mississippi River more than a few years ago. But having relocated to the Quad Cities area from Galesburg back in the summer of 2014, I caught wind of a nearby fishing hole that an August 2015 Quad City Times article referred to as the “area’s latest jewel. After a family day trip to Scott County’s Lost Grove Lake last spring for a look around I deemed it worth a try and invested my $41.00 in a non-resident fishing license. 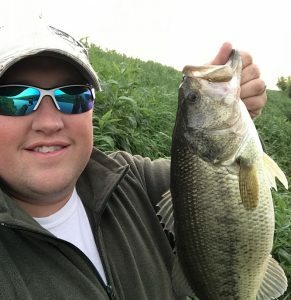 A pair of trips in June resulted in 25 bass during just over nine hours on the water but quality fish were pretty much non-existent on the end of my line. 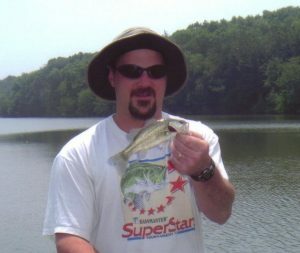 Top Bass wound up being a 14.5” fish that tipped the scales at 1-9 and was one of only two bass in my haul to exceed 12”. On the bright side, I did see a handful of fish in the 2 to 4-pound neighborhood and have seen a couple photos of some sizeable catches on the internet. But it is still a quite young lake and based on stocking reports and a firsthand look at the habitat of the 360 acre fishing hole I am enthused about its prospects for the future. Okay, so we’re talking the lure not the band or the location despite what I considered an entertaining tease on Facebook yesterday. If nothing else, I amuse myself, not really too hard to do, but hopefully also hooked a few of you to get you over here on the blog. 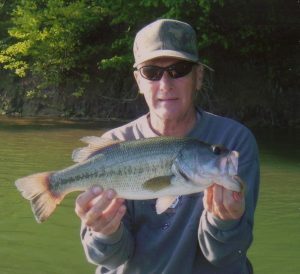 For as long as I’ve considered myself a bass fisherman, the blitz of can’t miss, latest rage, new thing lures have certainly caught my attention. 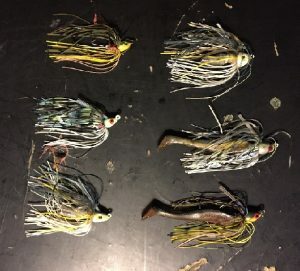 Slug-Gos, Banjo Minnows, Flying Lures, The Tornado, bladed jigs, giant sized (and priced) swimbaits and even a wacky looking worm rig have all sought to empty the piggybank with the promise of filling the livewell. Skipped some, bought some, some worked, some didn’t, still got some of them stashed somewhere in the tackle collection and that crazy looking worm setup is on the end of one pole pretty much every outing. 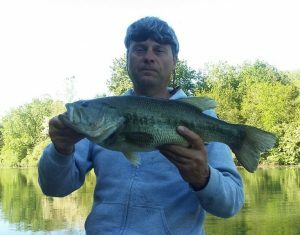 I threw it around last November without fooling anything and have only landed one bass on the contraption, an 11.5 incher back in 2014. 7/6/14 at 5:53am 11.5″, my one and only Alabama Rig bass, therefore, the record…for now. So for 2017, my resolution is to set a new Alabama rig personal best. As you can see from the above photo, size wise that ain’t a very tall order. However, from a confidence standpoint it could be a challenge in selecting this lure when I’m used to throwing something else. Yet I do have a handful of numbers lakes or off the beaten path fishing holes where I just might be able to pull off this proposed “record” catch as the fish are either unpressured, dumb, or both. I figure I gotta do these while I still can, right? Ah, yes, the stupid fishing stunt. Pulled more than a few of these over the years including last year’s mosquito infested walk. 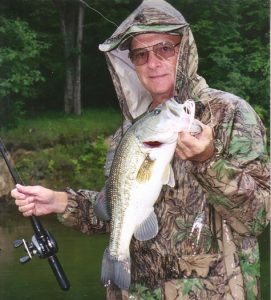 But, as noted in the recent “Spring Stroll” posting, enough time has passed and a successful start to the fishing season has me fired up to try another hare-brained idea to land some bass. The targets for this adventure are a pair of lakes that lie well off the beaten path at some public walk-in strip mine ground. My last casts into these waters was over ten years ago when I landed two dozen bass in two and a half hours in September 2006. Quantity was an upside but quality left something to be desired with the best just over a pound and a half. 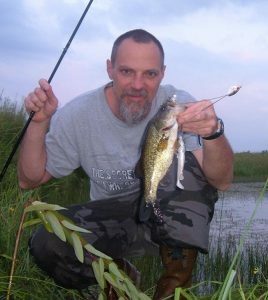 Another downside was access as the 2006 trip found me crawling on all fours through a tangle of brush with several fishing poles and too much tackle while trying to find a suitable spot to cross a substantial patch of swamp and return to my truck in the impending darkness. Yet, I always suspected that there had to be some better fish in these out of the way and unpressured spots. It was just a matter of willingness to mount a return expedition in hopes of finding an alternate route into the somewhat “unknown” as opposed to sticking with tried, true and easier to access fishing holes. Fast forward to a report I received last year from a fellow fishing fool which confirmed some quality fish and the wheels started turning. However, I must add that his report also emphasized that the trek in and out pretty much stunk. But in between there was some pretty solid catching. 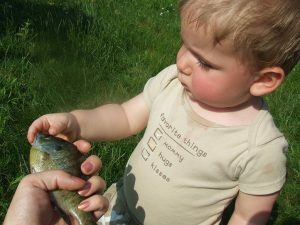 Music to a fishing dad’s ears but not always feasible or logistically possible. Won’t get into the particulars on the reasons or excuses but last summer wound up with pretty much constant work from the Fourth of July through Labor Day really making a mess of things. 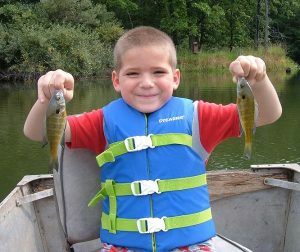 As a result, we only had two opportunities in June to get the kids on some fish but were quite successful during those outings. 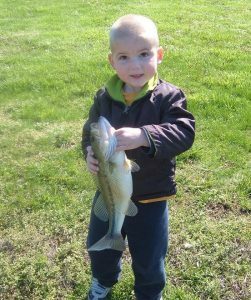 But from a parent perspective it’s not simply about how many and how big the fish are. It’s also been cool to see the progression from stubby Mickey Mouse kiddie poles to regular sized spincast combos and more recently getting the hang of a spinning rig. 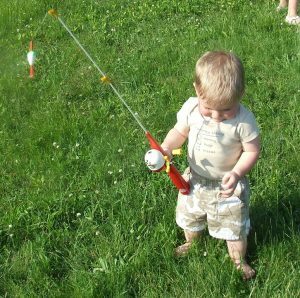 The evolution from having mom or dad cast to nowadays winging out a slip bobber setup with increasing distance and accuracy has also been a treat. And simply looking down a stretch of bank to see four young anglers casting, reeling, laughing, hollering, smiling and catching is about as good as it gets. 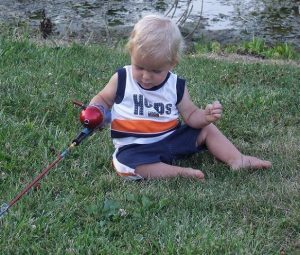 Looking forward to the day when they get the hang of baiting their own hooks and taking off their own fish so mom and dad can expand that line of anglers for a little friendly grown up vs. kid competition. So for 2017 we gotta get in some more of that family fishing time. Only six more days of school for this bunch and a summer with a few less activities this time around mean that there’s no excuse for anything short of a record year of reeling ‘em in. When it rains, it pours as we get a much needed dose of Top 5 submissions from a pair of past champs. Way to go guys, especially since there’s been a lot of raining and pouring as of late around Illinois. Angler Comments: Weather was fairly good and fishing was pretty slow there, water was up a little and stained. Caught a few fish and was heading to the ramp to call it a day. Along the way I decided to make one more stop before going. I was throwing a Texas rigged Zoom lizard in black/chartreuse. Boat was about 10′ from the bank and threw that lizard in front of a flooded bush in about 3 foot of water. I lifted the line and it slowly moved to the right. 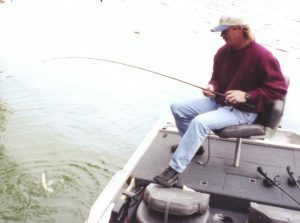 After setting the hook a bass surfaced on its side and started doing donuts on the surface of the water. Around the bush, to the bank, then jumped, another donut, jumped again, dove down circled the bush and I finally netted it. 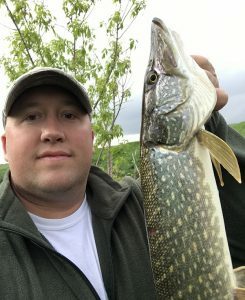 Angler Comments: Decided to go back the next day with my girlfriend and try again, it was Mother’s Day and it was her idea anyway. We caught some small ones on Black and Blue Flaked Wave Worms to start. I switched over to that lizard and caught some bigger fish. My best of the morning was a 5 lbs. 8 oz. Angler Comments: I went to check one of my creeks last night and when I got there conditions were less than favorable. Actually they were quite high with visibility about a foot. Initially I was just going to go back home but something was nagging as I walked back to the car. I decided screw it I’m fishing since the wife was at work and I had plenty of time to start getting things ready for my Canada trip. I walked down to the one spot I really wanted to fish because even though I was expecting to catch nothing it was the only place I felt I might have a real chance at a fish. I only had the tube on the end of my rod so there was no changing lures. On the third cast dragging the tube on the bottom I felt a thump and set the hook. I brought this 19.5 inch 4.1 smallie to hand. Angler Comments: After a few more casts I snagged something on the bottom. In my efforts to free my tube the hook actually broke off so that seemed to be the end of fishing. I walked back to the car and drove home to get my gear ready for my Canada trip at the end of the week. While I was preparing everything I kept feeling this itch to go back so after I finished up I drove back to the creek. This time I decided to try a swim jig figuring the thump of the tail might help in the murky water. I tried initially bringing the swim jig upstream with no success. I repositioned to the downstream position and I was quickly rewarded with this 16″ 2.1lb smallie. 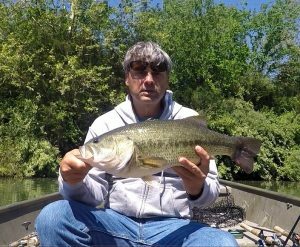 Angler Comments: A few more casts in the same area and I pulled out the biggest largemouth bass I’ve ever caught on this creek. Prior to last night I had never caught anything over about 12-13″ until I caught this behemoth. She went 20 1/4″ and 5.2 pounds! 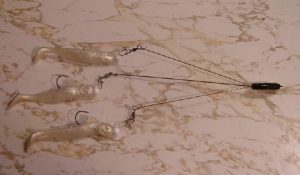 Angler Comments: After a few more casts and what felt like small pecks I decided to change casting angles and let the current bring the tube towards me. 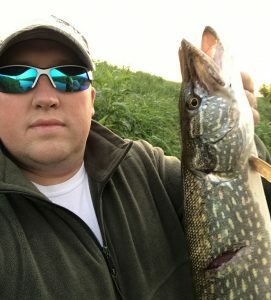 I was rewarded with this 31 1/4″ pike. 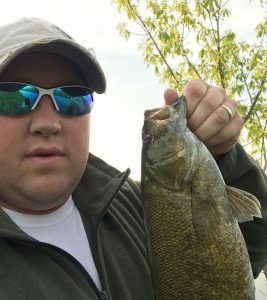 Angler Comments: Just for grins I decided to switch to the tube which netted me another real nice smallie. I guessed it at around 16-16.5″ but she swallowed it really deep and was bleeding. I promptly cut the line and released her to give her the best chance at survival. At that point it was back to the swim jig so I retied. A few casts and I could feel fish bumping it but not taking it when suddenly another big thud. It ended up being another nice northern that taped 30″.